This very rare China 1975 2 Yuan note was never issued and is not listed in the Standard Catalog of World Paper Money (often called the "Pick" catalog). 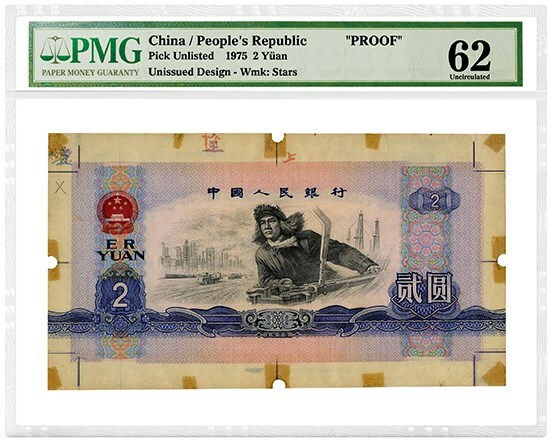 Paper Money Guaranty (PMG) recently authenticated and graded a stunning, unlisted 1975 People’s Republic of China (PRC) 2 Yuan proof note. It is graded PMG 62 Uncirculated. This proposed 1975-dated design was ultimately not approved for circulation and was never officially issued. Unlike many proof that are printed on thin India paper, this proof is printed on bank note-grade paper watermarked with patterned stars. Given the high-quality paper used, and the fact that the main print design on both the front and back is in high-quality intaglio, the design was evidently quite well progressed before the proposed design was rejected. Printer’s annotations, measurement marks and mounting remnants are clearly visible on the note, but fortunately they are constrained to the selvage area and do not affect the main body and beauty of the note design. 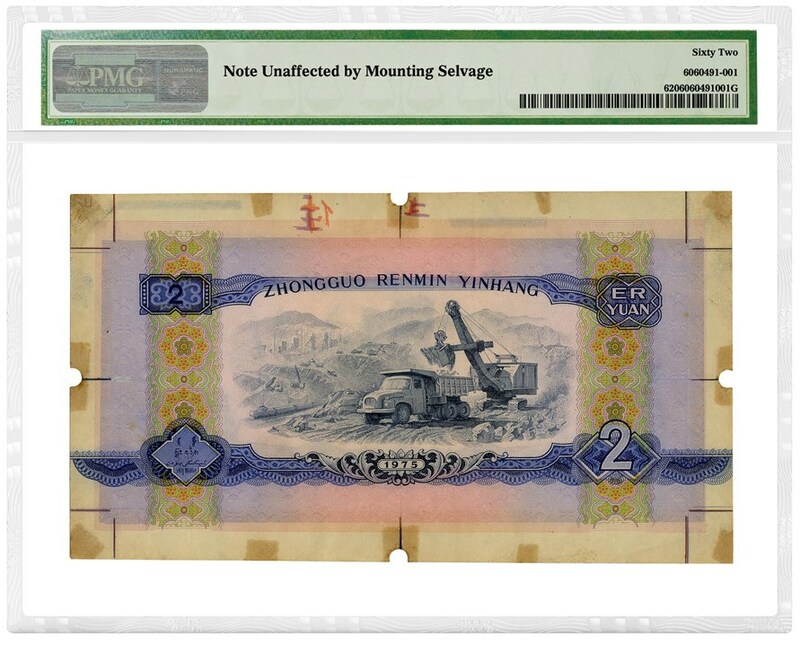 An ungraded example with similar looking design is recorded to have been sold by Beijing Chengxuan Auction Company in a November 2010 auction for RMB 1.68 million (about US $253,000 based on historical exchange rates of the time). Had this note been issued, it would have fallen between China’s 1972 5 Jiao issue and the 1980 PRC series issue. Similar design elements from both the 1960 (Third Series RMB) and the 1980 (Fourth Series RMB) seem to have been incorporated into this proposed 1975 2 Yuan design. The front and back central vignettes on this note share the same general look as the vignettes on the 1960 series notes, while the border design elements share the same general look as the 1980 series notes. Speaking of vignettes, who is that fur-capped gentleman on the front of the note? He is none other than “Iron Man” Wang Jinxi, a model worker and socialist hero. Wang Jinxi (1923-1970) was born to a poor peasant family in Yumen County of China’s Gansu province. 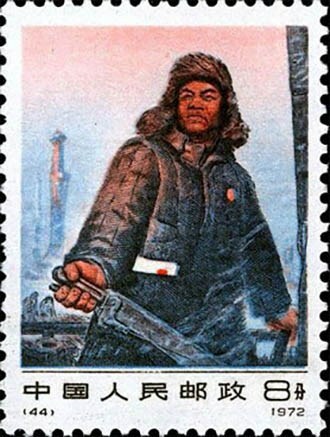 He rose to fame in 1960 tirelessly working in the Daqing Oil Field in northeastern China (the construction site of the Daqing Oil Field is the vignette pictured on the back of the note). When Mao Zedong and China’s Central Party Committee decided in 1960 to develop the Daqing Oil Field, despite fatigue and injuries, Wang Jinxi and his famous No. 1205 Drilling Team braved temperatures of between -20 and -30 C to strike oil. Within three years, Daqing became China’s first world-class oil field. Wang Jinxi is also famously known for preventing an imminent well blow-out. Faced without mud-mixing equipment that would help prevent a blow out, he jumped into the mud pool and mixed the mud with his own body! In 1967 he was made a national labor model, and in 1968 he was elected to the Ninth Central Committee of the Communist Party. He died of cancer in 1970. Wang Jinxi’s hard work and sacrifice embodies the “Ironman Spirit” of the nation. Wang Jinxi’s image on the front of this 1975 unlisted 2 Yuan proof seems entirely fitting for the time and records an important transition period in China’s paper money design.